RICHMOND — The Democratic gubernatorial candidate in Virginia is slamming his Republican opponent over past comments regarding the judgment of God and the sin of abortion. Terry McAuliffe will be releasing a series of advertisements to take a swipe at his challenger, Ken Cuccinelli, by highlighting various comments made by Cuccinelli that he deems to be radical. His latest advertisement is entitled “Future Holds,” and highlights a statement made last year in Ashburn at Cherish Life Ministries’ Christian Life Summit, where Cuccinelli spoke on the issue of abortion and the withholding of the wrath of God. Another advertisement released this week also jabs Cuccinelli for his views on abortion, and also divorce, again asserting that the Republican candidate is “too extreme” for office. Cuccinelli had likewise run ads regarding McAuliffe’s abortion advocacy last month, stating that his Democratic challenger supported abortion on demand. 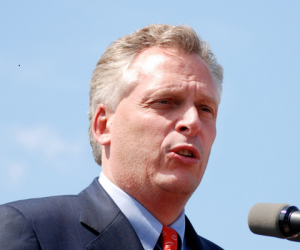 “Terry McAuliffe: not our values. Wrong for Virginia,” it concludes. Both Ken Cuccinelli and Terry McAuliffe are Roman Catholic. Cuccinelli is the current attorney general of Virginia and McAuliffe was the chairman of Hillary Clinton’s presidential campaign in 2008, and also served as the chairman of the Democratic National Committee from 2001 to 2205.